This week is clean-out the frig and freezer week since we won’t be cooking at home much during the holiday week. I also want a couple of easy meals for the week so that we can focus on other things. 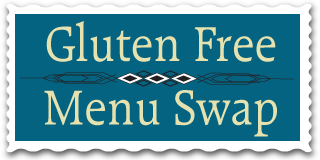 This week’s host for the Gluten Free Menu Swap is Celiac Family and her ingredient is onions. We love onions and garlic here at our house and almost every meal I make contains one or both. This week we’ll be having our usual amount of onions, nothing special. But our two new dishes for the week are both Indian – we love Indian food! Frequently gluten free and easily transformed to vegetarian. Saag Paneer with Rice – to use up the other half of the block of paneer, part of which was used for last week’s meals. Tofu Tikka Masala – to use up the block of tofu in the refrigerator. A perfect opportunity to make this dish! Vegetable Soup – from Fresh from the Vegetarian Slow Cooker (Robin Robertson), a family favorite. Taco Salad – to finish off the avocados that have been left lonely on the counter. Spaghetti and Salad – to finish off the salad fixin’s and not leave any vegetables in the crisper, as they will be added to the sauce or salad. And for leftover night, a little something special. On a whim, I bought a block of Brie, well, not really a whim, I was coerced by the girl at the sample counter at Trader Joe’s. (Ha! I wasn’t really coerced, but it was too tasty to not buy some.) She had topped it with some maple syrup, almonds and dried cranberries and baked it till gooey. Serve with plain rice crackers and green apple slices. And perhaps a glass of wine. Delightful! Be sure to hop on over to Celiac Family and check out the other meal plans. As well, you can check out OrgJunkie for tons of ideas! Love the idea of clearing out the refrigerator. Since I just went grocery shopping and filled it up, I think next week is going to have to be my cleaning out week. I’ll try to make my menu as tasty as yours sounds this week. Congratulations! You were the winner in my contest for Elana’s Almond Flour Cookbook. :) I’ll email you and you can send me back your address. Happy Holidays!